Last year, Stephen D. Cohen, author of Lessons from the Podium, kindly sent me a copy of his book. A hectic schedule and already-bulging reading list kept me from getting to it until recently. Lessons from the Podium is a quick read. It is only 110 pages long (excluding endnotes) but with several blank pages and lots of white space, it is closer to 80 pages of text. The book is divided into five main sections: Leading Through Speech; Connecting with Your Audience; Using Your Voice; Constructing Memorable Messages; and Delivering Specialized Speeches. Every time you deliver a speech, you are … leading. Whether you are a student, an executive, a politician, or a professor, you must lead your audience toward a particular objective. Your job isn’t simply to communicate ideas to your audience members. Your job is to show them that you are a leader. However, Cohen’s discussion of the “Leadership Mindset” is a mere 1½ pages in length. He then changes gears to talk about, in short order, the need to evaluate yourself, overcoming nervousness, eliminating filler words and using natural gestures. Only then does he return, at the end of the first chapter, to a more detailed analysis of how to champion a cause. I would have preferred the entire first chapter to focus on the relationship between public speaking and leadership, supported perhaps by opinions from psychologists or at least some anecdotes or insights about famous leaders and their public speaking experiences. A personal anecdote from Cohen himself would also have been a nice touch. Although the book tends to jump around from topic to topic, there is value to be found. Cohen’s analysis of the musicality of one’s speech will be useful for those who struggle with vocal variety. I also enjoyed the chapter on specialized speeches (impromptu, persuasive and inspirational) with its analysis of snippets of speeches from people such as Barack Obama and J.K. Rowling. Here again, though, I would have liked more detail. As you have probably guessed, my main criticism with the book is not with the content; rather it is with the quantity of the content. As a lecturer on public speaking at the University of Maryland and Harvard Extension School, Cohen clearly knows his stuff and could undoubtedly have written more. I don’t think that seasoned speakers will find much that is novel in Lessons from the Podium. Nevertheless, I do think that Cohen’s work is a good book for beginning speakers. It contains lots of useful ideas. Even if many of these ideas are covered relatively briefly, there is enough information to get readers thinking about their own speaking habits. And they can always pursue points of interest in greater detail elsewhere. 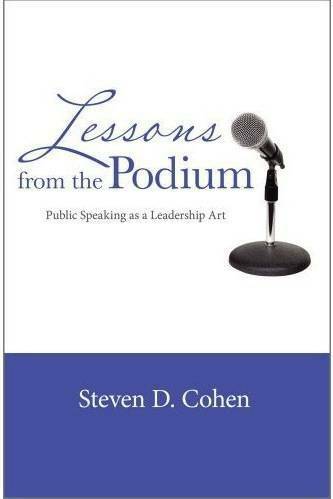 This entry was posted in Book Review and tagged Book Review, Leadership, Lessons from the Podium, public speaking, Stephen D. Cohen. Bookmark the permalink.